These plates are issued to commercial truck dealers. They can be used for vehicle demonstration purposes while under load, while regular dealer plates can be used for unladen vehicles only. This type was first listed in the registration books in 1919, with numbers 1 through 49 initially reserved that year; though examples are reported as early as 1917. These early plates had an SX prefix, which continues to this day. 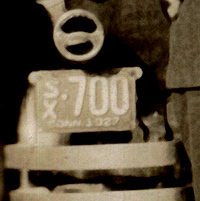 When this was introduced, normal dealer plates had an ‘X’ prefix. Thus, Special Dealer logically became ‘SX’. Generally these plates have followed the same design and colors as New and Used car Dealer plates. However, unlike New and Used Dealer plates, these plates are issued consecutively – there is no prefix letter used for the group of plates issued to a particular dealer. Briefly, for the 1954-1956 plates, “Spec. Dlr.” was spelled out on the plates. These plates are often loaned by the dealer to someone who has purchased a new truck, for use while the registration is being processed. Also, they are used on loaner trucks while a customer’s truck is being repaired. This is allowed for not more than 15 days per year per customer. Until 1967, these plates were also used on trailers owned by boat dealers, for transporting boats and trailers between the place of business and a demonstration location. Reference: Chapter 246 Sec. 14-59, 14-60, 14-63-16. Like passenger car plates, the length of the plate varied with the number of digits. Oops! Wrong type legend on this plate.